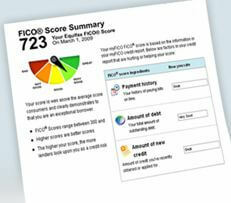 What is a credit score ? How is it calculated ? Credit Score is a number usually given between 300-850 based on an individual’s credit reports (Credit History Reports), though there is no fixed rule of arriving at a credit score, but the higher the score the better deals you get from lenders. Credit scores are directly proportional to your creditworthiness. It is widely accepted that a score of 700+ is considered good and any score less than 600 is considered high risk group. Each event in a person’s credit affects the credit score, and the score change depends upon the significance of the event. 1. % of usage of credit utilized. 2. Payment History – If you have paid on time on Credit card, Mortgage or Utilities. 3. Lenght of Credit History. 4. Type of Credit – The more types of credit you have a better score. 5. Recent Credit Enquiries on the Credit Report. Lenders usually provide credit approvals based on the Credit Score, a good score means instant approvals and an average score will lead to scrutiny and an Bad score often outright rejection. Next PostNext What is credit History and Credit Worthiness ?